Lucy Lee Daniels Roberson, 73, of Hamden, entered eternal rest on April 25, 2018. She was the widow of Mac Arthur Roberson. 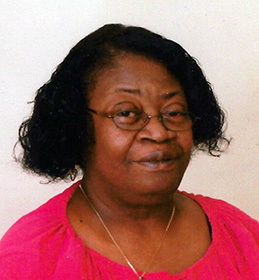 Mrs. Roberson was born in Robersonville, NC on June 30, 1944, a daughter of the late Artis and Hattie Daniels. She had been employed at Milford Health Care Center for numerous years. Lucy leaves to cherish loving memories, a daughter, Pamela Roberson; a nephew, whom she raised as a son, Ray Daniel Sanders; five grandchildren; three great grandchildren; and a host of other relatives and friends. She was preceded in death by brothers, Artis, LeVernon and Willie Ray Daniels and Frank Andrews. A celebration of Mrs. Roberson’s life and legacy will be held Monday, April 30, 2018 at 11:00 a.m. at Curvin K. Council Funeral Home, 128 Dwight St., New Haven. Viewing and visitation will be held from 10:00-11:00 a.m. Burial will be in Evergreen Cemetery.